Lilys are the brainchild of singer/songwriter Kurt Heasley. In fact, I'm pretty sure that he's been the band's only constant member since their inception in the early 90's. This constant rotation of band members has actually been beneficial, because each new Lilys album has its own distinct sound and feel. A Brief History of Amazing Letdowns is an EP released in 1994 that combines the fuzzed out guitars of shoegaze with great pop hooks. 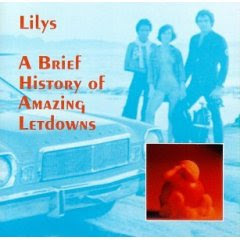 This is probably my favorite Lilys record because the short length leaves very little room for filler, and it showcases some of Heasley's finest songwriting moments. Wow, never heard of these guys. Thanks!